A moment of quiet with Rafael Nadal's Uncle Toni in the late evening hours after the 2013 U.S. Open. 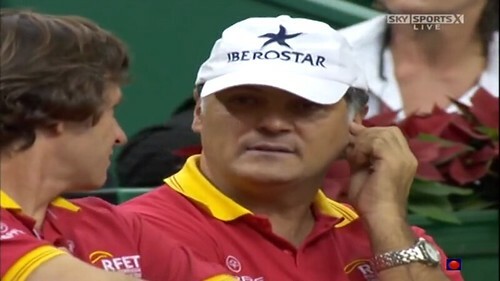 Uncle Toni: Alright, now, Rafa. Lights are out at midnight. I’m giving you an extra hour to celebrate, but I’m going to be checking up on you. That means you too, Maria. No keeping him up. It’s bad enough the tabloids are getting pictures of you now. For awhile there we almost tricked the world into believing that Rafa was a tennis playing cyborg that had no interest in women. So, like I said, lights out at midnight. 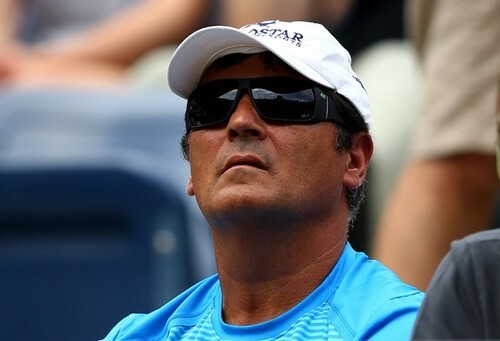 Uncle Toni: Ah, Nueva York. It is true that this tournament is different than the rest. Of course, I like Roland Garros very much. Rod Laver is a wonderful stadium too, but Australia is too hot. And Wimbledon is beautiful, but it’s too British for my liking. I never cared for champagne or cream. Just plain strawberries for me. There is an elegance to this tournament. Perhaps it is the lights. Yes, they shine so sharply upon the Mercedes logos on the nets. The richest people in this rich city come out to cheer for their favorite player and to dangle their watches and jewelry. Under the lights, the tennis becomes more exciting, more epic; it fits what these people want from their lives—only the best and the most beautiful. And they want to see the effort that goes into giving them both of those virtues. Yes, it’s all blue court, black sky and platinum lights. This cigar is going to my head. It’s a good, though. It’s rolled tightly and the smoke pulls easily. It feels like I am not even smoking at all. Rafa earned that victory tonight. Djokovic is a worthy opponent. I like him alright; he thinks he’s a comedian, though. I saw how he tried to win over the crowd at the trophy ceremony by making that self-deprecating joke. And what was going on between him and his team? I think that they were trying to steal my move of talking during the match. I invented that move! If you’re going to use my technique, at least be like me and admit that you are doing it. He’s alright, Djokovic. A bit of a payaso. But I do admire the resiliency of his hair. We’ll have to get better to beat Djokovic at the Australian. Oh, the grind of these seasons. Life is always passing isn’t it? You prepare for the tournament, ride through the emotion, the tension and the pleasure and then all of a sudden it’s over and you’re just left with a cool night and a cigar, and preparations for the next one. When do we enjoy things? Oh, this cigar is very good. I’ll have to buy quite a few more. I’ll have to think of some new kinks to throw into the training regimen. Rafa’s defense was good, as was his attack on the net. We can work off that. However, he must learn to trust his two-handed backhand. I must teach him to fear failing with it, so that he has no choice but to trust it. What kind of drill can I think of? Tying his hands in the backhand form and making him shoot that way from all angles of the court? Perhaps. But maybe that is too impractical. I can always watch a Rocky. Those movies work for me. It’s hard to fool Rafa and to fill him with fear like I used to. He’s successful now, there’s no doubt about it. He’s close to being one of the best ever. Maybe I can take him back to those terrible courts—mierda—and show him how far he’s come, but that he’s not that different from what he once was then: just a little boy who needed to learn that surface doesn’t matter, but only your endurance. Ah, and the cigar is burnt down to the band! Another thing finished and gone before you know it. I’ll be sad to leave this city tomorrow. They say that New York is the best in September, but we have to continue on. We will go back to Spain and take a break for a week and then get back to training for the Australian. Rafa and Maria can’t get carried away with the sunbathing on the boat. That reminds me. What time is it? I’ve got to make sure that Rafa and Maria went to bed.